This delightful Mountain Ash tree boasts large, dark-green, lobed foliage and fluffy white flowers in the spring, which are popular with bees and other wildlife. These flowers are followed by beautiful large red berries 12mm in diameter, that hang on to the tree for quite some time into the winter months. Sorbus hybrida ‘Gibbsii’ has an attractive rounded crown and will reach approximately 8 x 8 metres in 20 years. 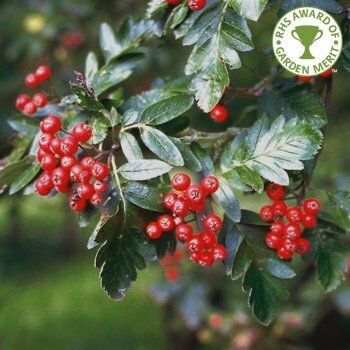 This Rowan variety has received the RHS Award of Garden Merit and is low maintenance, preferring moist but well-drained soil in either full sun or partial shade. It will also tolerate atmospheric pollution. Position: Full or part sun, tolerates atmospheric pollution. Our pot grown Gibbsii Mountain Ash trees can be planted at any time of the year. Start by removing weeds and grass within a metre of your desired planting hole. Dig a square hole as deep as your root mass and approximately 2x as wide. To help the tree establish more effectively, sprinkle root grow in the hole. We recommend planting Sorbus Gibbsii trees with a stake and tie kit. For single stakes, place the stake at an angle to avoid penetrating the rootmass and knock it in until it is firm. Use a buckle tie, placing the spacer between the stake and tree. Gibbsii Mountain Ash trees require a strong framework to support their large red berries, so it is good to encourage this by raising the crown in summer. Simply prune the lower branches and any crossing, damaged or diseased branches within the crown. Hard pruning of Sorbus Gibbsii trees can be carried out in the dormant season, from autumn to winter.